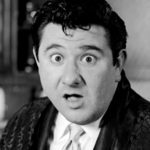 Buddy Hackett was an American comedian and actor. His best remembered roles include Marcellus Wash burn in The Music Man (1962), Benjy Benjamin in It’s a Mad, Mad, Mad, Mad World (1963), Tennessee Steinmetz in The Love Bug (1968), and Scuttle in The Little Mermaid (1989). "As a child my family’s menu consisted of two choices: take it or leave it."